Have you taken a walk through Manhattan’s Lower East Side recently? Noticed pops of color on storefront? 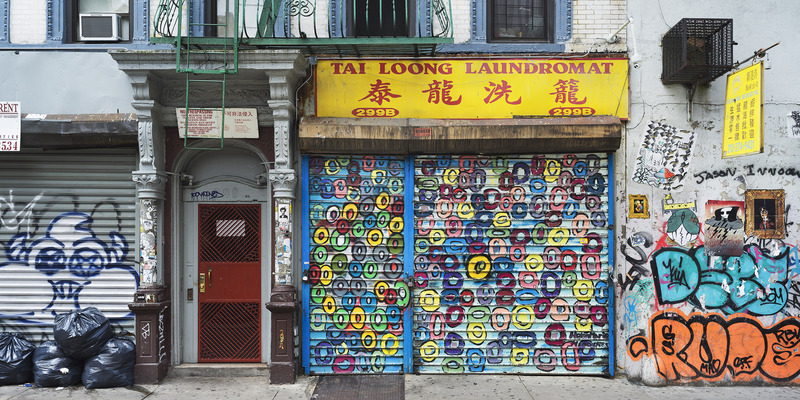 What you’re looking at is the 100 Gates Project, a venture started in summer 2014 by artist and skater Billy Rohan in collaboration with Lower East Side Partnership (LESP), a neighborhood non-profit. The project’s aim is just what you see: a beautified Lower East Side. Throughout the neighborhood, the 100 Gates Project has commissioned murals on the roll-down security gates of stores. LESP assists with funding and connects street artists with business owners interested in having their gates painted. Painting the gates brings art to the streets—and deters unwanted graffiti. By the end of 2015, 75 gates had been painted. The end goal—100 gates—was reached in September 2016. Fittingly, the 100th gate painted was none other than the front of Katz’s Delicatessen store, an iconic neighborhood institution established in 1888. Want to see the gates? Head over to the Lower East Side. Most of the art is concentrated on the streets highlighted on the map below. Tip: Early mornings and late evenings are the best times to view the gates—since the gates are only visible when businesses are closed. Here are some of our favorite pieces from the 100 Gates Project. Based on it’s success in the Lower East Side, the 100 Gates Project has been awarded funding to beautify two additional neighborhoods: East Harlem and Downtown Staten Island. On your way to the Lower East Side, you may also come across other 100 Gates Project-inspired murals: the 88 Gates project in China Town. We love seeing street art brighten up New York City! We’d love to hear from you what you think about the 100 Gates Project. Share your reviews and photos in the comments. All photos in this article are from Damien Derouene. These photographs may not be reproduced, distributed, modified or re-posted to other websites without the express written permission of the author.